Castelluccia Petit Bouche Gypsy Jazz Model Acoustic Guitar, c. 1955, made in Paris, France, natural finish, laminated mahogany body, spruce top; French walnut neck with ebonized fingerboard, black tolex hard shell case. This is a very fine vintage French Selmer-style guitar by well-regarded Paris luthier Jean-Baptiste Castelluccia, founder of a dynasty still going strong. This guitar is missing its label but has all the known Castelluccia traits, including the monogrammed tailpiece. The hardware is unplated brass and all bindings are wood. 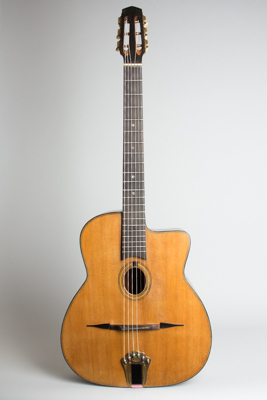 Based on the cosmetic and structural features it likely dates to the early-mid 1950s, although these handmade Parisian guitars are notoriously difficult to date exactly. Castelluccia was a more refined craftsman than many of his contemporaries, and this is a very finely made instrument with a higher level of workmanship and finish than most period Selmer-inspired instruments. A lovely guitar to play and a beautiful version of the iconic "Django"-style instrument. Overall length is 40 in. (101.6 cm. ), 15 1/2 in. (39.4 cm.) wide at lower bout, and 4 in. (10.2 cm.) in depth at side, taken at the end block. Scale length is 26 in. (660 mm.). Width of nut is 1 13/16 in. (46 mm.). This guitar shows moderately heavy play wear overall, most notably to the top below the strings and sound hole. Apart from a very good pro refret, it remains nicely original, with just some old crack repairs. There are several short grain splits to the top between the fingerboard and sound hole, and a long spruce grain crack running from above the bridge to the back edge, all solidly sealed. The tuners and tailpiece appear original, the tailpiece carrying Castellucia's monogram. These older Parisian-made Selmer guitars are very hard to find in good playing condition; most were literally played into the ground by the itinerant Gypsy or cafe musicians of that time and place. This is a completely authentic and excellent playing guitar with a very bright and focused sound, especially fine for small group use, as it cuts through other instruments exceptionally well. Very Good + Condition.